As a trainee journalist back at the London College of Printing in the early 1980s, we were taught that to capture the heart of a “story”, it was essential to talk to the taxi driver who took you to the job. Those were the days when it was taken for granted that journalists still took expenses-funded taxis everywhere. Over subsequent decades I had lots of conversations with taxi drivers. Bluebird, which premiered at the Royal Court in 1998, revisits that past with compelling authenticity. But even now, when buses, the Tube and the pavement are surely more the norm, it remains pertinent to the present day. Simon Stephens is now an established playwright and we take his excellence for granted, thanks to productions such as the multi-award winning Curious Incident and The Young Vic’s A Doll’s House. Bluebird was however just his second play. It is tightly and beautifully written and shows all the pieces in place that led to what he is today, in particular, the striking originality brought to bear upon the apparently quotidian life of the taxi driver. This was what our journalism lecturer was trying to say, that it is in the every-day observances of the ordinary that we uncover the extraordinary. Beneath everything that is seemingly banal is some story worth uncovering. I tried to imagine myself in the place of a young playwright knowing inwardly of his extraordinary potential, knowing what he could do but knowing perhaps he had limited chances to get it right. Perhaps such a playwright might look to the things in the life ahead that could derail his passage to that successful future he knows could be his. And perhaps one of those imagined horrors could be the death of a dearly loved child in the most awful circumstances. Or perhaps he knew of people this had happened to. It happened to my family – to our brother, to a cousin. It happened to the present Archbishop of Canterbury who lost his first daughter in a terrible car accident. It is happening right now to the people losing children, whole families, to the slaughter in places such as Aleppo. It is the most awful thing imaginable, yet it happens to more people than we can imagine. 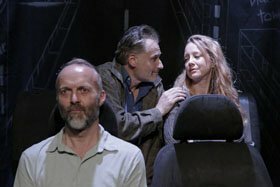 From such a point of tragedy, a disaster that we don’t at first understand, Bluebird unfolds in both a lateral and linear direction, a structure that pulls the audience right inside the taxi and keeps us there until we’ve paid the fare – the price of our attention. In some respects, this cannot be an easy jigsaw to assemble, but Amanda Root’s direction does justice to Stephens’ writing and she manages the intersections seamlessly. At first, we share the taxi driver’s lateral point of view as he hears the stories of his passengers, sometimes with reluctance and sometimes with engagement. Then in the second half, we hear his linear point of view as his own terrible story unfolds. And yes, it turns out he was once a brilliant writer, but finds he no longer has anything to say, so locked into grief is he by the tragedy. The act of sharing, of talking, of bringing the story out, is what provides some sort of closure in the end. It is the power of the words combined with the skill of the cast that pull us in and take us on that journey. By the end, we are in that taxi. It is all of our stories. Malcolm Freeman as taxi driver Jimmy Macneill has an intelligent enquiry in his eyes and a sadness in his demeanour that underpins the whole play as he renders a heartrending performance of desperation combined with determination. Selina Giles as his wife Clare is classy and convincing, her luminously expressive features moving through hatred, denial, grief and love with breathtaking power. They are joined by a stellar cast, many of them with multiple awards and credits to their name, playing the series of passengers in the taxi – Daniel O’Meara, Christien Anholt, Mark Griffin, Emma Louise-Saunders, Jennifer Hanah, Nicholas Newman, Lisa Gorgin. The intimacy of The Tabard makes this production an education in stage-craft as well as an education in the proverbial “life”. I’m so pleased I saw this. Catch this ride while you still can. From Simon Stephens, the award-winning playwright of The Curious Incident of the Dog in the Night-Time, comes Bluebird. Bluebird follows Jimmy, a mini-cab driver, over the course of one night in London, exploring the city’s A-roads, back alleys and the lives that dwell around them. Jimmy listens as his ‘fares’ tell their individual stories in the back of his Nissan. He hears from a father mourning the murder of his daughter, a bouncer’s memory of a violent night at his club, a disillusioned engineer of London’s underground, as well as, finally, Jimmy’s estranged wife Claire. Because as it turns out, Jimmy’s own is the darkest story of all. Simon Stephens is an award-winning playwright, and the Artistic Associate of the Lyric Theatre, Hammersmith. He has won the Olivier Award for Best New Play twice, once for On the Shore of the Wide World in 2005, and recently in 2013 for The Curious Incident of the Dog in the Night-Time. Directed by Tony-nominated actor Amanda Root (Persuasion, All About Me, The Iron Lady), the cast includes Mark Griffin (Gladiators, Daddy Day Care, Dr Who), Selina Giles (V for Vendetta, Until Death, Restoration), Christien Anholt (Reunion, Relic Hunter, Hamlet) and Daniel O’Meara (John Carter, Ironclad).